There's a lot to take in over the 11 days of the Philadelphia International Festival of the Arts, from Ann Carlson's Doggie Hamlet (five dancers, three dogs, lots of sheep) to Elizabeth Streb's SEA (Singular Extreme Actions), both local premieres. One that will be tough to miss: a nightly performance by French troupe Compagnie Transe Express of Cristal Palace, a world premiere in which more than 50 performers will create a nearly 40-foot human chandelier, topped by musicians. May 31–June 10. kimmelcenter.org/pifa. Although she constantly pushes the level of risk in her work, Streb Extreme Action Company artistic director Elizabeth Streb surprisingly looks for more than just a passion for physicality when recruiting dancers action heroes. We went to S.L.A.M (Streb Lab for Action Mechanics) to get an inside look at a rehearsal, and quickly learned that though she may have an addiction to danger, Streb isn't quite as tough as she seems. A sense of teamwork is really clear amongst your dancers when they are working. How is that something you have tried to instill in your company environment? You have to be a team in this work or you are in big trouble. It certainly wasn't like that in the beginning. So this was an end game for a very incremental process. I figured out how to have people who love people in the room. It's a very pacific concept but it's a humane concept. And as we went along we realized it's our job to be socially kind and interested in anyone who walks in the room. Speaking of which, your rehearsals are all open to the public. Is that something you have always been interested in doing? When we moved from the Canal Street studio to garages in Williamsburg they were all on the ground floor, so we started practicing what it meant to invite the community in and let people who walk by and don't know Streb come in and be interested in watching us. And that's changed my set of questions and has changed who I'd like our public to be. The level of risk in your work heightens each year. How do you visualize that risk in the beginning stages of a new work? There's this great quote from Tim Cahill that says "the explorer is the person who is lost," so I don't pretend to know what I'm doing. I have an idea—is it the spinning ladder idea? Is it the high speed windshield idea? In any of those circumstances where we try to create a sense on unfamiliarity in the space, I don't really pre-amp ideas. If I know before I see it then it's happened before. When you're performing with a whirling cinderblock or giant hamster wheel as your partner, there is no time for second-guessing your physical fitness. Fortunately, STREB EXTREME ACTION member Cassandre Joseph knows exactly what her body needs to stay safe, even when flying off 30-foot platforms. What are the five habits that prepare her to tackle anything that director Elizabeth Streb might throw her way? What's Not Okay to Ask A Dancer to Do? To create great work, choreographers need the freedom to tackle difficult subjects and push physical limits. But when your instruments are human beings, is there a limit to how far you should go? Five choreographers open up about where they draw the line. 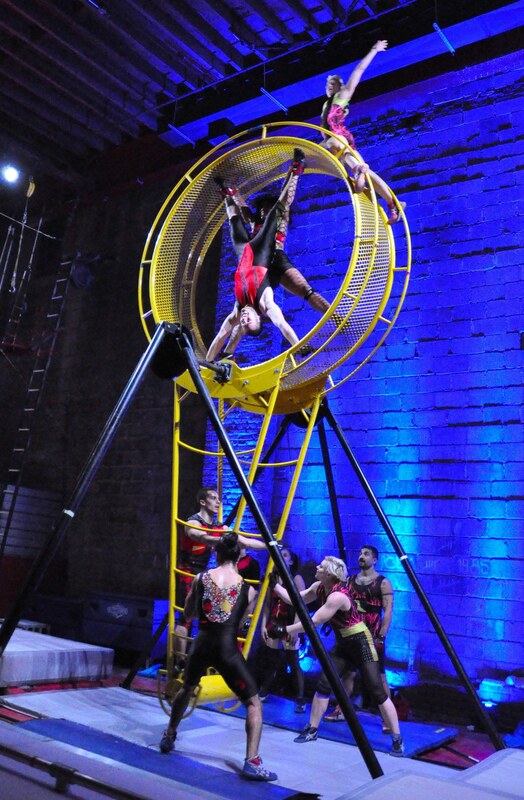 A STREB Extreme Action show is nothing like a typical dance performance. Instead, it's a full-on battle between gravity and humans. There will be risk-taking, you will probably gasp (multiple times) and you might even clench your jaw. That's because artistic director Elizabeth Streb likes to push her dancers action heros to the max. What exactly are we capable of? How much further can we go? She's out to answer those questions. STREB's Samantha Jakus.Courtesy Bergdorf Goodman. It's not every day that auditions are held for superheroes. Especially not in Williamsburg, Brooklyn, home planet of the mortal hipster. But on a spotless day in September, approximately 75 hopefuls gathered at the Streb Lab for Action Mechanics (SLAM) to test their mettle and face their fears. 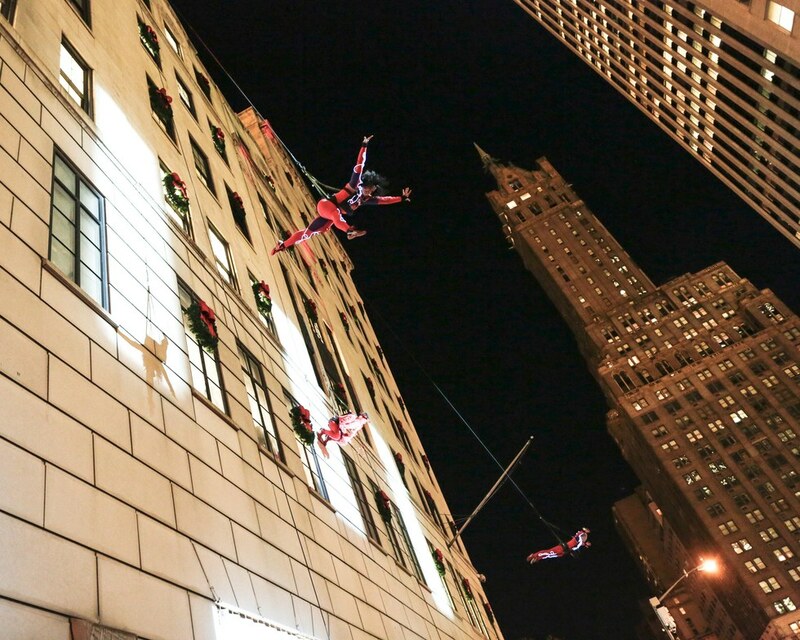 STREB's Samantha Jakus runs down the side of Bergdorf Goodman. Photo Courtesy Bergdorf Goodman. “Skip your brain and go right to the gut," instructed Elizabeth Streb, the woman with the spikey black hair, thick black glasses and all-black outfit who had attracted them there to audition for STREB, her “extreme action" company. After an admonition to “use the wiser side of prudence to protect yourself," company members taught a routine based on pop action, the technique Streb developed to train and protect the body in its frequent attempts to outsmart physics. The dancers were on their stomachs as much as they were on their feet. It was the first of a three-day process to determine who had what it takes to be a STREB warrior, which, according to associate artistic director Fabio Tavares, an 11-year veteran of the troupe, includes “good muscles, good lines and good energy." For the past three decades, Streb's brand of extremism has challenged and disrupted the very tenets of dance, an art form that is perhaps an imperfect fit for her physical interests. For the most part, dance has embraced her, even if it doesn't always understand her. As part of an artistic community that treats the body like a sacred vessel, her eagerness to throw it in harm's way has sometimes been met with a degree of discomfort. 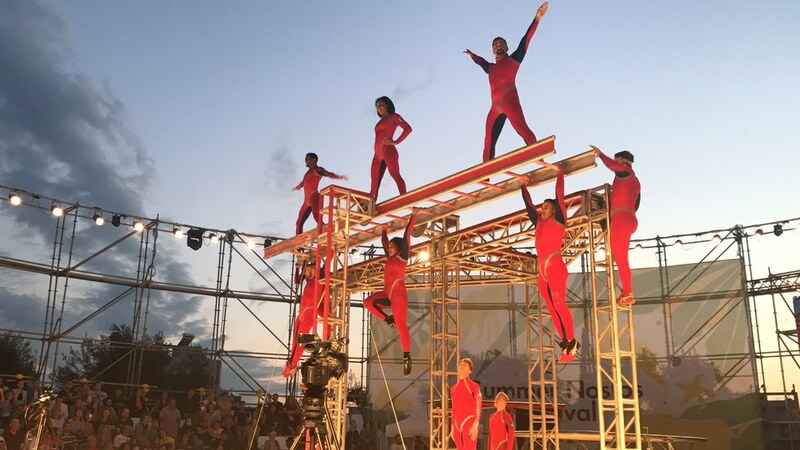 Indeed, the tasks Streb asks of her dancers—running on the top of a giant hamster wheel, narrowly dodging a spinning I-beam, nose-diving from a 35-foot platform—strike many traditional choreographers and performers as more akin to stunt work. Flying through air and water: STREB in Kiss the Water. Courtesy Antoine Douaihy. But there is also the clear stamp of an artist in the clarity of her intent and the imagination behind her ideas. Her dancers are always responding in the moment to the conditions she places before them, usually in the form of site-specific obstacles or custom-made giant apparatuses. Though running, jumping and falling are essentially pedestrian acts, Streb's application of them requires a strong and highly specific technique. "What we do is train the body to be a single unit to really go places in space, and deal with taking impact," she says. Once dancers are in the air, she considers the picture. Lines matter, but "the images are secondary and tertiary, even." She says she may "inflict slightly artificial decisions into the choreography" by shaping a position or pausing it for visual effect. Ultimately, though, the focus is not on what her performers do, it's where they go. Inevitably, thanks to gravity, that direction is usually down. Acknowledging this, Streb has many safety nets in place to help her dancers protect their bodies. She has had mathematicians calculate the velocity of falling bodies so her landing pads are appropriately engineered; the customized mats are usually replaced every three years. And in addition to extensive training, company members are supported with full health insurance as part of their yearlong contracts. During stretches of performance, they are also entitled to one bodywork session of their choice each week. Left: Playing with physics in Forces. 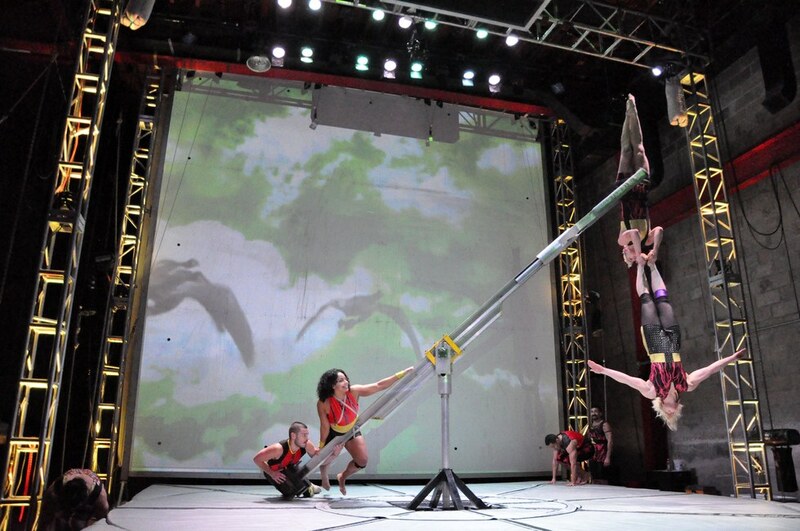 Photo by Elyssa Goodman, Courtesy STREB. But for such uncompromising work, the dancers also rely on supplemental training. Former company member Sarah Donnelly, who now teaches at SLAM, says she worked out seven days a week during her years with STREB. "I had to work very, very, very hard to get myself prepared for the work," she says. Having studied classical ballet but with no previous acrobatic experience, she did cardio every day, weight training three times a week and took extra pop action classes in the evenings, focusing on gymnastics and aerial work. Tavares, on the other hand, who was an acrobat in his native Brazil, is now a certified instructor of Alexander and Klein techniques, and many of the STREB dancers take class from him. He also practices zero balancing (essentially massage for the bones, rather than the muscles), tai chi and meditation. He says he has no knee, wrist or back problems. Next year, he'll be 40. Which isn't to say he hasn't been seriously injured while working for Streb. In early 2012, he fell in a show in Holland and broke his ankle in three parts. On her third day of rehearsal, Donnelly dislocated her shoulder, but attributes most of her lingering issues to nearly two decades of ballet. In 2007, the company was thrown into the spotlight when dancer deeAnn Nelson broke her back at what should have been a benign moment during a performance. But in Streb's work, a second's miscalculation can have drastic repercussions. “It reminded you that injury can happen at any point and time," says Streb, who was criticized for continuing the performance. She doesn't like talking about the incident, largely because it has perhaps unfairly come to symbolize the dangers of her work, even though no other such injuries occurred before or since. “I felt that as a director I had failed," she says, acknowledging that dynamics in the company at the time might have contributed to tension in the room. Ultimately, she takes full responsibility: “It was all my fault." The incident hasn't diminished Streb's appetite for risk or softened the company's sense of recklessness. There is a rule in STREB that dancers can't say no. But that doesn't mean they are forced to do tasks against their will. “We never use the word 'no,' but we come up with creative elusions," says company member Cassandre Joseph. As in, “I don't have it today, maybe next month." Limits may include falling from a certain height, or bowing out of a move that has bred injury in the past. “When I think about my career, I want to pick and choose my battles," says Joseph. Streb has her limits, too, but often can't identify them until it's too late. When asked if her limits will only reveal themselves once crossed, she says: “I think so." 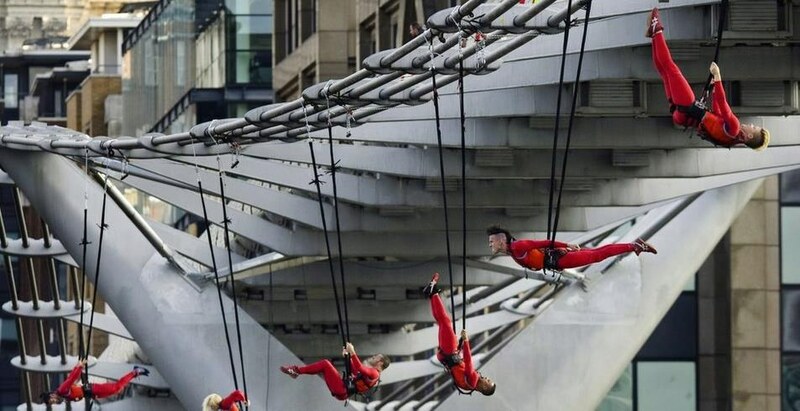 Right: Hanging off Millennium Bridge at the 2012 London Olympics Festival. Photo by Julian Andrews, Courtesy STREB. Still, her band of superheroes will follow their Professor X to wherever her mind takes them. Part of this trust, says Donnelly, is Streb's ability to create a cohesive community. But she also points out that "the work automatically builds camaraderie because you're forced to rely on someone." Tavares explains his willingness to follow Streb another way: "It's a combination of the inner appetite we have for extreme action and falling in love with her and her persona." At least half of Streb's work is a test of psychological endurance as much as a physical one. “The fear is so overpowering and so crippling that you have to develop many methods to combat it," says Joseph. One of her methods is a personal mantra, which she draws from quotes by Muhammad Ali: “I am the champion of the world" and “I'm gonna show you how great I am." Joseph listens to a track of Ali quotes as part of her pre-show playlist. “It's all about filling myself with undeniable confidence," she says. “Confidence that is so strong that there is no room in my head for doubts and hesitations." Donnelly, for her part, engaged in what she called “fear training" to push past her comfort zones; she tried extreme sports like skydiving as well as mountain biking at dusk to train the body to orient itself with less and less light. “The more you practice taking risks," she says, “the better you are at saying yes and understanding what is required of you when you do." Fear isn't just for the dancers; it's a unique ingredient in viewing Streb's work as an audience, as well. Ballet may evoke a spectrum of emotion, but rarely does it inspire the kind of pulse-racing, gasping thrill of witnessing Streb's intense experiments. “She teaches us with the work that you can't be fearless unless you are also fearful, at least at some point," says Catherine Gund, the director of Born to Fly: Elizabeth Streb vs. Gravity, a new documentary film that follows the artist and her company over several years. “Because there's no way to let go of something you don't own." Not all dancers wish to face their fears on a daily basis, which is why Streb attracts a specific type of performer and why they remain so loyal to her. “If you're in love with the work," says Tavares, “you stick around as long as you can." Of the current team, more than half have been with the company for five years or more. Members say there is a sense, when one is a part of STREB, of truly living life to the fullest and being able to conquer any obstacle. Leaving, therefore, can induce an especially difficult withdrawal. “It's probably the hardest thing you'll ever do," says Donnelly. “I got very addicted to the adrenaline." Brian Schaefer writes on dance for The New York Times.